Fig. l: The dotted lines are sympathetic contact areas all along the muscles of the back. Superior, middle and inferior locations make then a polarity field of action. The left side of Fig. 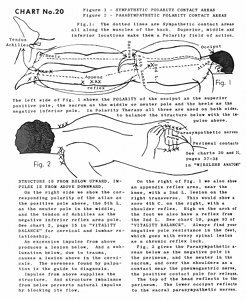 1 shows the polarity of the occiput as the superior positive pole, the sacrum as the middle or neuter [neutral] pole and the heels as the negative inferior pole. In polarity therapy all three are used on both sides, to balance the structure below with the impulse above. Structure is from below upward. Impulse is from above downward. On the right side we show the corresponding polarity of the atlas as the positive pole above, the 5th L. [fifth lumbar, L5] as the neuter [neutral] pole in the middle, and the tendon of Achilles [Achilles tendon] as the negative inferior reflex area pole. 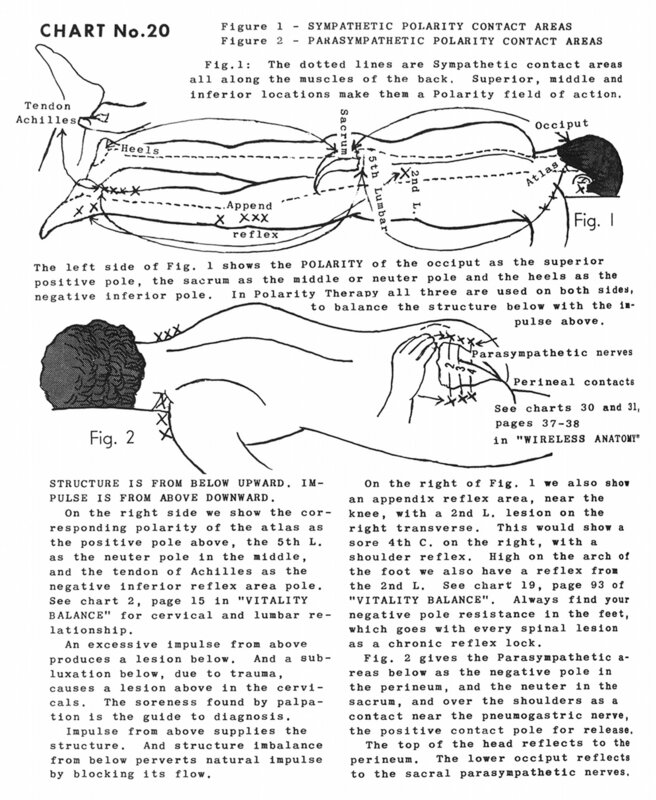 See Chart 2, page 15 in "Vitality Balance" for cervical and lumbar relationship. An excessive impulse from above produces a lesion below. And a subluxation below, due to trauma, causes a lesion above in the cervicals. The soreness found by palpation is the guide to diagnosis. Impulse from above supplies the structure. And structure imbalance from below perverts natural impulse by blocking its flow. On the right of Fig. 1 we also show an appendix reflex area, near the knee, with a 2nd L. [second lumbar, L2] lesion on the right transverse. This would show a sore 4th C. [fourth cervical, C4] on the right, with a shoulder reflex. High on the arch of the foot we also have a reflex from the 2nd L. [second lumbar, L2] See Chart 19, page 93 of "Vitality Balance". Always find your negative pole resistance in the feet, which goes with every spinal lesion as a chronic reflex lock. See Charts 30 and 31, pages 37-38 in "Wireless Anatomy"
Fig. 2 gives the parasympathetic areas below as the negative pole in the perineum, and the neuter [neutral] in the sacrum, and over the shoulders as a contact near the pneumogastric nerve [vagus nerve, CN X], the positive contact pole for release. The top of the head reflects to the perineum. The lower occiput reflects to the sacral parasympathetic nerves.